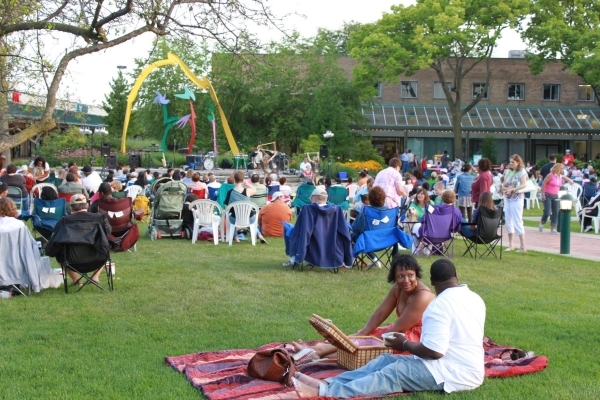 Park Forest, IL—(ENEWSPF) — Park Forest’s Main Street Nights kicks off this week with music and entertainment to make your Wednesday summer evenings sizzle. The family-oriented Main Street Nights features local and regional entertainers on stage in the Village Green located at Cunningham and Victory Boulevard in DownTown Park Forest. In addition to the weekly entertainment, vendors and civic groups will be selling snacks and beverages, plus Dunagains Irish Pub featuring grilled items and sides. Grab a blanket or a lawn chair and enjoy the free entertainment under the summer stars. Details for June 13th can be found in the ‘Arts & Entertainment’ section. If you’re interested in a career in highway construction, South Suburban College will be offering a Free Highway Construction Careers Training Program this summer at their Oak Forest Campus. Orientation and Assessment Testing will be June 12-14 at the Oak Forest Center, with the program set to begin on July 9, 2018. The Highway Construction Careers Training Program has been implemented to increase the number of minorities, women, and disadvantaged individuals working on IDOT highway construction projects. The training consists of an intensive 12-week program to learn the skills necessary for acceptance into the highway construction trades and gives the opportunity for a career with high wage potential. You can find additional information about the program in the ‘Educational Lectures & Opportunities’ section. Beginning Monday, June 11, the Will County Department of Transportation (DOT) will begin resurfacing stretches of Monee Road and Western Avenue. It is anticipated that work will continue for approximately a month and a half. During this project, residents will experience various construction inconveniences such as traffic congestion, delays, parking restrictions, dust, noise, heavy equipment, and temporary no-access to driveways. For additional information, call 708-748-1112 or visit www.villageofparkforest.com. Monday, June 11 at 3:45 p.m. – Little Yogis – Meditation and relaxation exercises for ages 5-7. Wear comfy clothing and bring your water bottle and a yoga mat, if you have one. Mats will be provided for those who do not have one. Register. Monday, June 11 at 4:30 p.m. – Yoga for Tweens – Meditation and relaxation exercises for ages 8-13. Wear comfy clothing and bring your water bottle and a yoga mat, if you have one. Mats will be provided for those who do not have one. Register. Monday, June 11 at 7 p.m. – Book Club – Discussion of I Am Malalaby Malala Yousafzai. For adults. Monday, June 11 at 7 p.m. – Knot Just for Knitters – Share camaraderie while working on knitting, crocheting or any other type of needlework project. For adults. Tuesday, June 12 at 1 p.m. – Gary Kantor Magic Show – Come and watch a thrilling magic show by Gary Kantor. His show is packed with vanishing acts, mind-reading tricks, and a variety of hilarious tricks that will have the children rolling on the floor with laughter. For all ages. Register. Tuesday, June 12 at 2 p.m. – Gary Kantor Magic Workshop – A workshop where children will learn how to do a variety of magic tricks including card tricks, vanishing effects, and more. In addition to the fun of magic, this workshop will emphasize the importance of education and reading. Each child will receive a magic kit to take home. For ages 5-13. Register. Tuesday, June 12 at 7 p.m. – How to Choose a Telescope – Learn about the different types of telescopes and how to choose one you can afford. This program is geared for adults, but is open to families with children ages 8 and up. Register. Wednesday, June 13 & Thursday, June 14 from 10 a.m. to 2 p.m. – AARP Smart Driver – An 8-hour refresher course designed for drivers age 50 and older. Fee is $20 ($5 discount for AARP members), payable the first day of class. Must attend both sessions to receive certificate. Register. Wednesday, June 13 at 6 p.m. – Sing Along STEAM – Children will sing about science concepts to the tune of familiar songs while using props and objects. For ages 0-5. Register. Thursday, June 14 at 6 p.m. – Family BINGO – Enjoy a family night of fun and prizes. For all ages. Thursday, June 14 at 7 p.m. – Knot Another Ball of Yarn! Crochet Group – Learn to crochet or bring your own crochet to work on in this twice a month group. Friday, June 15 at 2 p.m. and Saturday, June 16 at 10:30 a.m. – Stuffed Animal Camping Trip – Send your stuffed animals on a camping trip at the library! From 2-3 p.m. on Friday, enjoy stories and snacks along with your “camper”. Then leave him overnight at the library to play with friends. Re-join your “camper” at 10:30 a.m. on Saturday for brunch and a slideshow to see what antics the stuffed animals got into overnight! Saturday, June 16 at 1 p.m. – DIY Minecraft – Make your own Minecraft pillows. For ages 8+. Register. Monday, June 11 at 4 p.m. – All Day Drop In Projects — Stop by Teen Tech Zone for a spur-of-the-moment activity! Monday, June 11 at 4 p.m. – Explore This World of Wonder — Drop in to the Explore space and discover something new. Tuesday, June 12 at 11 a.m. — kids Tie Dye Tuesday — Join us for one of the most popular summer projects — “Tie Dye”. Design something special to go with your summer wardrobe. Materials provided. While supplies last. For ages 12 and under. Tuesday, June 12 at 12:30 p.m. — Digital Literacy Workshop: Online Shopping — Find out the best sites to enjoy a safe online shopping experience. Registration Required. Tuesday, June 12 at 1 p.m. – Summer Safety with the Park Forest Police — Join Sergeant Julius Moore as he shares important and helpful tips on how to keep kids safe and healthy while enjoying the outdoors. Stories and crafts to follow. For ages 12 and under. Tuesday, June 12 at 4 p.m. – Color-Rama! Coloring Circle — Cool down inside from the summer heat with a fun activity that helps you to unwind and relax! Wednesday, June 13 at 11 a.m. — Books & Baby Time — Babies and their parents or caregivers are invited to read, sing and grow in this weekly story time. This program is geared toward babies 0 – 36 months with an accompanying adult. This is the perfect time for families to bond with their child/children. Wednesday, June 13 at 1 p.m. – Canvas Kids — Drop in and discover your inner artist with and create a one of a kind masterpiece. All Materials Provided. While supplies last. For ages 12 and under. Wednesday, June 13 at 4 p.m. – Adult Coloring — Join us and relax a bit with our coloring circle. All supplies are provided. Wednesday, June 13 at 4 p.m. – All Day Drop-in Projects — Stop by Teen Tech Zone for a spur-of-the-moment activity. Wednesday, June 13 at 6:30 p.m. – Writers’ Workshop — Want to improve your skills as a writer? Interested in sharing your ideas or written work with others? Come to the Park Forest Library and join other creators in our bi-monthly writers’ group, led by James Pressler, for all your writing wishes. Writers of all skill levels are welcomed. Thursday, June 14 at 11 a.m. – Toddler Time — Bring your imagination and creativity to bring out your inner Picasso through art projects and more… Some projects may involve paint. Ages 3-5. Thursday, June 14 at 1 p.m. – Jenga Challenge – Are you ready? Take a break for the sun and Join us in kids’ zone for another suspenseful game of Jenga. Test your skills and see if you will be the champion. For ages 12 and under. Thursday, June 14 at 4 p.m. – Teen Movie — Cool down this summer with a featured film! Thursday, June 14 at 5 p.m. – Digital Literacy Workshop: Online Shopping — Find out the best sites to enjoy a safe online shopping experience. Registration Required. Friday, June 15 at 1 p.m. – Wii U Game Day — Join us for an afternoon of wild and crazy fun with the Wii U! Are you up to the challenge? For ages 12 and under. Friday, June 15 at 3:30 p.m. – Teen Game Day — Show off your competitive side with your friends! From board games to video games, there will be plenty of fun. Saturday, June 16 at 11 a.m. — Organic Gardening — Join Master Gardener Margaret Burns Westmeyer, from the University of Illinois Extension, as we learn about Organic Gardening. Saturday, June 16 at 12 p.m. – Seed Library Social — Come for free seeds and exchange your gardening knowledge with fellow gardeners. Saturday, June 16 at 1 p.m. — Make it Yourself Father’s Day Project — Join us for a special craft that is sure to make dad proud. Saturday, June 16 at 1 p.m. — Live Arts: Acrylic Painting with Sandra Evers — Join Sandra Evers of the Salon Artists Gallery while she paints and gives us tips and tricks on her craft. ‘Studio Conversations,’ featuring works by Mary Bookwalter, Carol Weber, and Janice Meister will open on Monday, June 11 and run through Thursday, July 19. An artists’ reception will be held on Thursday, June 14 from noon to 2:30 p.m. at the Gallery. Both the exhibit and reception are free and open to the public. ‘Studio Conversations’ is an exhibition of the three artists who have for years collectively discussed and critiqued their art. Knowing that artists work in the vacuum of their own studios, they found that sharing input to the actual art-making process is an invaluable part of this usually solitary venture. They also saw that their art making processes of mixed media collage and the common themes within their works were a strong basis for an exhibition. At each venue, the exhibition is updated with new works. The Christopher Art Gallery is open Monday through Thursday from 9 a.m. to 3 p.m., Wednesday and Thursday from 5 p.m. to 7 p.m. and by appointment. For additional information or to schedule an appointment to view the exhibit, call 708-709-3636 or visit www.prairiestate.edu/Christopher-Art-Gallery. The Rainbow Café will screen the movie ‘Freak Show’ on Friday, June 15 at 6:30 p.m. A discussion will follow the screening. Due to the on-going construction at the Unitarian Universalist Community Church, the event will take place at Trinity Luther Church, 2901 Western Avenue in Park Forest. ‘Freak Show’ tells the tale of Billy Bloom who has absolutely no desire to be like everyone else. When others call him theatrical, he takes it as a compliment. ‘The nail that sticks out gets hammered down’, his father warns him. That does not deter Billy from deciding to run for homecoming queen. Somewhere in-between David Bowie, Lady Gaga, Freddy Mercury and Oscar Wilde, in the transgressive space of pop culture and dressed up as a high school comedy with wit, heart and a dazzling cast, Freak Show is about the violence of conformity and the power of self-determination. Rainbow Cafe is a social event that provides a safe and welcoming environment for single or partnered gay, lesbian, bisexual, and transgender adults and their allies, by creating a space where they are able to socialize outside of the usual bars. The Café is open every 3rd Friday of the month from 6:30 p.m. to 10:30 p.m. For additional information, call UUCC at 708-481-5339 or visit www.uuccpf.org. Dazzling Acrobatic Dunks. Dazzling acrobatic flips and twists off mini trampolines mixed with comedy antics, mid-air passes and dynamic slam dunking deliver non-stop pure energy excitement to audiences of all ages. Generation.. “the Sixties Experience,” takes the audience on a Musical, Magical Sight and Sound Flashback to the 60’s, performing the Great Classic Rock hits from the 1964 British Invasion to the American Male and Female 60’s. SSC will be offering a Free Highway Construction Careers Training Program this summer at their Oak Forest Campus. Orientation and Assessment Testing will be June 12-14 at the Oak Forest Center, with the program set to begin on July 9, 2018. The Highway Construction Careers Training Program has been implemented to increase the number of minorities, women, and disadvantaged individuals working on IDOT highway construction projects. The training consists of an intensive 12-week program to learn the skills necessary for acceptance into the highway construction trades and gives the opportunity for a career with high wage potential. Career Opportunities Include: Cement Mason, Electrician, Pipefitter, Carpenter, Laborer, Equipment Operator. Requirements: Valid driver’s license, 18 years or older, High School diploma/GED, Interest working in the Construction Trades. Construction will always be needed for new buildings, roads, bridges, and other structures. Some of the more skilled construction careers such as engineer require higher education while others such as cement masonry can be learned as an on-the-job apprentice. All candidates MUST have a valid driver’s license with them to attend orientation. For more information or to download a copy of the study guide for the assessment test, please visit our website at www.ssc.edu/hcctp or call 708-596-2000, ext. 3219, or email [email protected]. Para Información En Español Llame: 708-210-5740. All orientation and assessment testing will be held at the Oak Forest Center. The Oak Forest Center is located at 16333 South Kilbourn Avenue, Oak Forest, Illinois 60452. The Illinois Department of Transportation, the Illinois Community College Board, and the participating community colleges do not guarantee employment upon trainees’ graduation from the Highway Construction Careers Training Program. First time non-credit students should visit the Admissions Office, Room 2348, or call Continuing Education at 708-596-2000, ext. 2231 to get started. For questions about these classes or STEM programs at SSC, please contact Anna Helwig, STEM Dean, at 708-210-5706. For more information about all of SSC’s programs, admissions and registration, please visit www.ssc.edu or contact the Admissions Office at 708-210-5718.